Pictured: Instructor Amit Baruch, right, pulls class participant Wolf Puls for a quick demonstration. Your job as a real estate professional means that you often break common-sense safety rules. You get into cars with strangers, you meet people you don’t know at vacant houses, you’re often working alone. 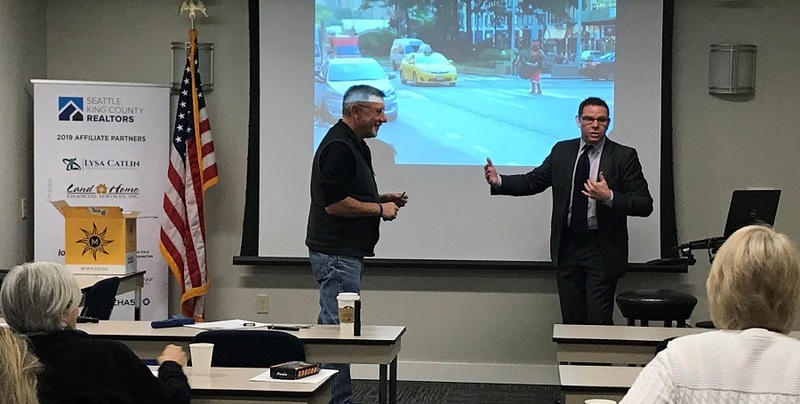 Real Estate Self Defense, a 3 clock-hour class taught by mortgage lender Amit Baruch, gives participants practical knowledge on how to stay safe while doing the job they love. “There is no one technique, move, skillset, or weapon that will work in every situation,” Baruch told the class. But, while no one deserves to be the target of a crime, there are steps you can take to keep it from happening to you. Being aware of your surroundings is a way to keep criminals from targeting you. Criminals look for people who have their head down, are on the phone, or have headphones in. Walking with your head up and making eye contact with people you pass lets them know that you are paying attention. Another good tip is to avoid doing open houses alone if you can help it. Bring a friend or colleague along or place a pair of shoes by the door to make it look like someone else is there. One of the best safety habits you can have is to trust your intuition. If something feels wrong, don’t be afraid to get yourself out of the situation. For all of Baruch’s safety tips and insights on how you can protect yourself on the job, sign up for his Real Estate Self Defense class. Amit Baruch has been involved in real estate finance, development and sales for more than 16 years. He is also a certified hand-to-hand combat instructor, training civilians, law enforcement and executive protection teams in Krav Maga, the close-quarter-battle system of the Israeli military. Although he can walk the walk when necessary, Baruch preaches and teaches the art of avoiding trouble altogether.